No longer do you have to put your important machinery on the floor or squeeze them in tight places on your desk. Office Chairs Unlimited has made the storage problem a thing of the past with our machine stands. 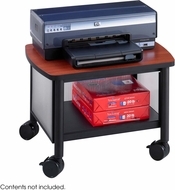 Fax machines, printers, and other small office equipment can now be placed on one of these easy to use machine stands. Features include multiple levels of storage, drop leaves, adjustability, slide away shelves, rotation capabilities, multi-functional, sorter, and they are mobile.